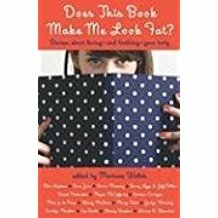 Summary: This book features short stories from well known youth authors such as Matt de la Pena, Ellen Hopkins, and Barry Lyga, to name a few. They feature a mix of mini memoirs and fictional stories with the theme being body image. Despite the title, not all of the stories are about being overweight; they include characters of all shapes and sizes trying to find their place in the world or society. Inside, you'll find a story where a dressing room mirror is the narrator describing the struggles of its viewers. Another shows that a makeover can change your life... sometimes not for the better. We also see that negative comments can often have more impact than positive ones. My Review: This is a very entertaining read and while this book is about a serious subject (body image), it doesn't take itself too serious. There were many times that I found myself laughing along with the narrator at the absurdity of the situation. Overall, this is a great book for preteens and teens, as it shows that everyone goes through the awkwardness of accepting their body. It also shows that some insecurities never go away. My favorite quote came from the first story when Daniel Pinkwater is discussing being overweight and if he would ever want to change. He says "if I could be any size I wanted.... I think I'd rather be the size I am, but with a better wardrobe." I just feels that it shows that it doesn't matter about how big or small you are but how you feel and represent yourself. This sounds like a good book. It also sounds like something I should have read when I was in school, however, it wasn't written back then.